These overstuffed burritos need little adornment, but if you like, top each one with a dollop of salsa, or with some jicama cut into matchsticks and tossed with lime juice and chile powder. 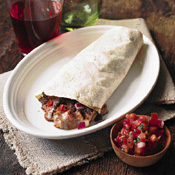 Whether plain or garnished, the hot burritos will be best with an extra squeeze of lime juice just before you dig in. Hot Italian sausage, black beans, tomato, and cheese all argue for a big, fruity red wine. Find a robust zinfandel from California; its blackberry flavor and intriguing woodsy quality will stand up to, and enhance, this dish. Heat the oven to 350°. In a large frying pan, cook the sausage over moderate heat, breaking it up with a fork or wooden spoon, until cooked through and just beginning to brown, about 10 minutes. Remove. Pour off all but 1 tablespoon fat from the pan and reduce the heat to low. Add the beans and salt and cook, mashing the beans with the back of a wooden spoon, until heated through, 2 to 3 minutes. Most of the beans should be broken up, but don't mash them to a puree. Remove from the heat and stir in the sausage, half of the cheese, the tomato, lime juice, and onion. Spread one quarter of the bean mixture in a line just below the center of each tortilla. Put the remaining cheese on top of the beans. Roll up the burritos and put them seam-side down in a small baking dish. Bake until the cheese is melted and the filling is hot, about 15 minutes. If the tops begin to brown too much, cover loosely with a sheet of aluminum foil. Serve the burritos with lime wedges. Reprinted by permission of Food and Wine. All rights reserved.